New photos of Swiss Jagdpanzers at the bottom of this page, plus new photos of our Hetzer being loaded for shipment to Germany! I am a member of a non-profit, tax exempt organization called the Texas Military Historical Society. We are a non-political group of history buffs dedicated to preserving the history and sacrifices made by the fighting forces of all nations, with emphasis on the years between 1939 - 1945. We are now in partnership with the Texas Military Forces Museum located at Camp Mabry in Austin, Texas. The museum is formed as the Historical Holding Unit of the Texas National Guard whose headquarters is at Camp Mabry. The Texas Military Forces Museum is dedicated to preserving the history of all the State Military Forces of Texas from the time of the Republic of Texas in the 1830's up to and including the present day. The Texas Military Historical Society forms the living history component for the museum by providing reenactors in period uniforms during ceremonies, public shows, educational demonstrations, and living history displays. In early 1987, a member of the Board of Directors of the TMHS introduced the idea that the society should seek donations of military equipment from the various nations which still possessed equipment from World War Two. Around April of 1987, after receiving approval from the Board, letters were mailed to the military attachés of 33 foreign governments. In August, 1987, a return letter was received from the Swiss government stating they were willing to donate one of their few remaining Pz.Jg. G-13s (Hetzers). Letters were exchanged with questions concerning condition of the vehicle (fully operational! ), availability of spare parts, manuals and so forth. In November of 1987, the Swiss were told that the society was accepting the offer of donation. Now transport had to be arranged for the G-13 from Switzerland to Texas. After exploring various options, the Board met with the Director of the Texas National Guard Historical Holding, the precursor to the Texas Military Forces Museum, and an under- standing was reached whereby the society would donate ownership of the G-13 to the Historical Holding in return for permission to maintain and operate the vehicle. Agreements were reached and legal documents completed in April of 1988. 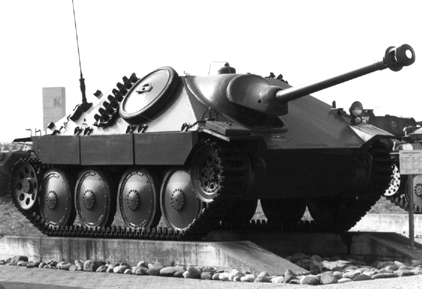 The Hetzer was now the property of the Texas National Guard. The problem was getting it to Texas. G-13 being driven onto the rail car in Switzerland. 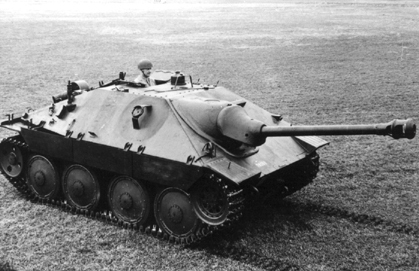 The Zurich American Insurance Company (the American subsidiary of Zurich Insurance Company of Switzerland), with which one of our members was connected, was approached about the company paying for rail transport of the Hetzer from Switzerland to Germany. The request was approved by the company's Board of Directors as a gesture of support and good citizenship as the vehicle was going to go on display in honor of the fighting men of Texas and since there was a subsidiary of the company here in America. One of the Vice-Presidents of the parent company also happened to be a reserve General in the Swiss Army. He was able to use the shipment of the vehicle by rail as a training exercise for his troops, some of whom accompanied the vehicle on the trip to Ramstein, West Germany. 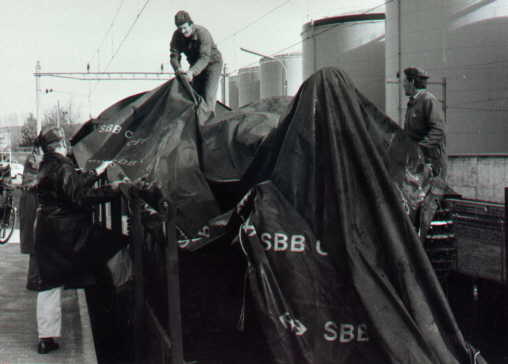 He actually supervised the loading of the vehicle onto the rail car at the depot in Grolly,Switzerland. At that point, U.S. Congressman Jack Fields of Texas, always a staunch supporter of our military forces, put his staff to work going through channels at the Pentagon to arrange air transport of the vehicle to Texas. Arrangements were made for a Mississippi Air National Guard transport aircraft on a training mission to pick up the Hetzer in mid-September, 1988 and fly it to the United States. In August, however, the Italian Air Force demonstration team crashed into a crowd of spectators at an air show at Ramstein, killing fifty and wounding dozens. This tragedy prevented paperwork from being completed in time for the Hetzer to catch the flight. Over a year, and several false starts, was spent in attempts to get a new flight arranged. 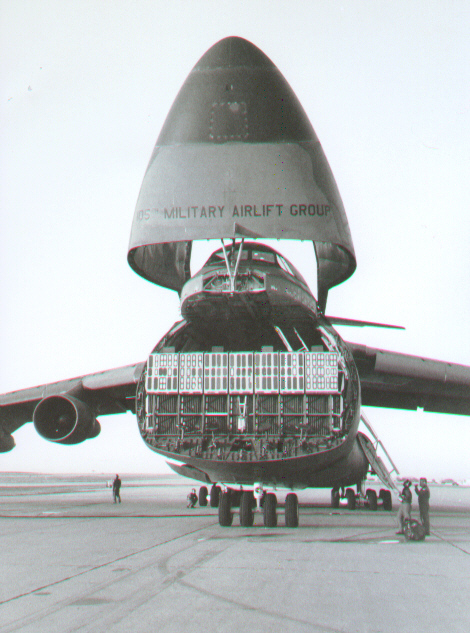 Finally a flight was scheduled on a New York Air Guard C-5A training flight in December of 1989. 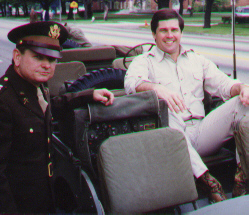 Congressman Fields is shown in civilian clothes seated in a jeep at a Memorial Day event with TMHS President in 1990, Bob Garlington, shown in a US Army officer's uniform. 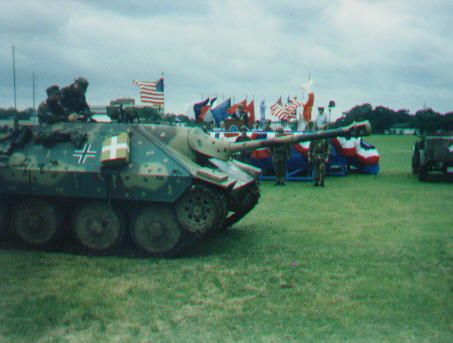 A photo of the Hetzer in front of the reviewing stand on the day it was formally presented to the Texas Military Forces Museum. 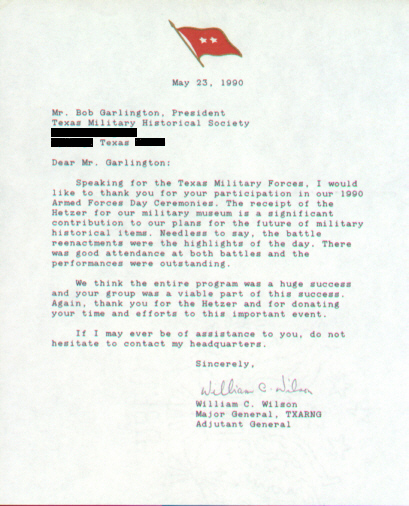 A copy of the letter sent to TMHS President Bob Garlington by the Adjutant General of Texas, thanking the organization for the donation of the Hetzer. 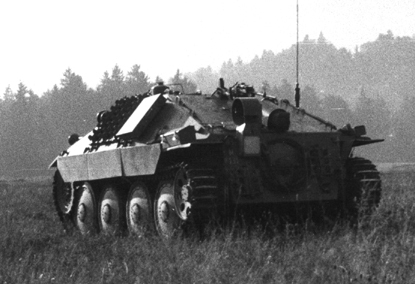 On December 14, 1989, in the late afternoon, following countless hours of work by TMHS volunteers, corporate donors, training missions conducted by the Swiss Army and the New York Air National Guard, our Hetzer landed at Bergstrom AFB outside Austin, Texas. The Texas Army National Guard was there to pick up the Hetzer and take it to Camp Mabry. To our surprise, the vehicle came with all sorts of spare track, spare roadwheel, tool kits, gun sights, manuals, and other accessories. Now the real work began! 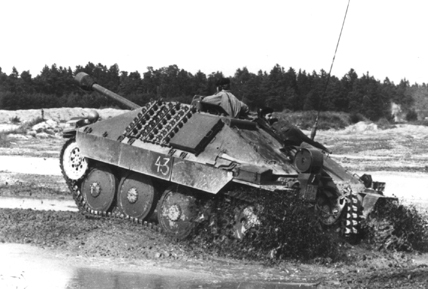 Despite the initial excellent condition of the vehicle, the year spent at Ramstein had created numerous minor problems for the Hetzer. 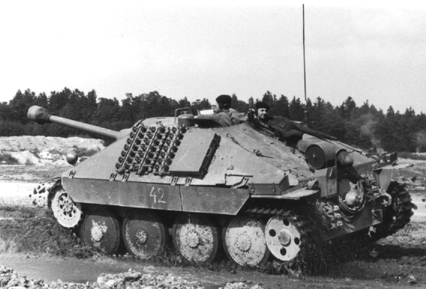 After initial inspections and cataloging of all the extras that came with the vehicle, January, 1990 began a period of intense work on the Hetzer. Every weekend found numerous members of the Historical Society working to restore/repair the Hetzer and teaching ourselves about the vehicle's operation. Problems ranged from a loose starter and generator, a cracked fuel siphon, bad batteries, etc. to parts of an old rag that had evidently fallen into the fuel tank and was now clogging the fuel pump. All problems were overcome by the diligent efforts of our small group of dedicated history buffs. Once the problems with the fuel system and starter etc. were corrected, we found that the vehicle was in excellent mechanical condition, started easily, and operated very smoothly. All repairs required over the years have proven relatively simple due to the technological age of the vehicle and the fact that the Swiss know how to care for their equipment. All costs of maintenance, except for occasional supply of fuel and lubricants by the National Guard, are borne by the regular crew members who are members of the Texas Military Historical Society. The Hetzer with its new paint job. 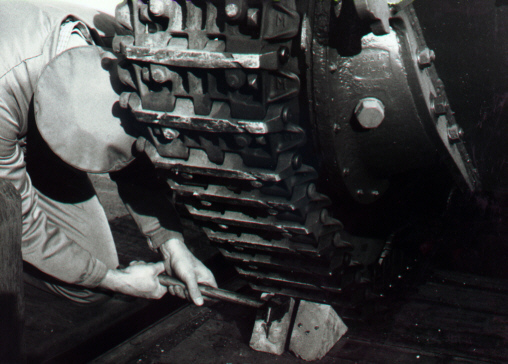 Compressed into the mechanical repairs were the initial cosmetic changes to convert the vehicle back to WWII German appearance, completely repainting the vehicle, and actually putting together and training a crew to operate the vehicle in the field. I was selected to become the driver (and primary point of contact between the crew and the National Guard). My first steps at driver training began as early as January 27, 1990. When not actually training on the vehicle under the guidance of an active US Army NCO who drove Bradleys for a living, I was translating the various Swiss and German manuals on the vehicle, thus gaining book knowledge and practical knowledge. 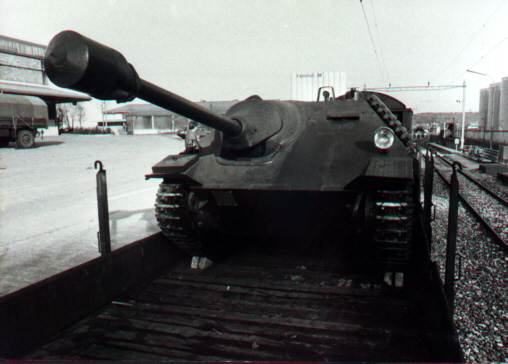 On March 9, 1990 I was "certified" as the driver of our Hetzer by the Army NCO and the vehicle was taken to a nearby training site for its first use in the field in a WWII combat reenactment. Since that time, the vehicle has undergone thousands of man-hours of maintenance and the improvement of the cosmetic conversion. It has appeared before thousands of people in public shows and living history displays, traveled to several different military posts for ceremonies, and is a prime attraction at the Texas Military Forces Museum where it is on display indoors (except when serving in the field). 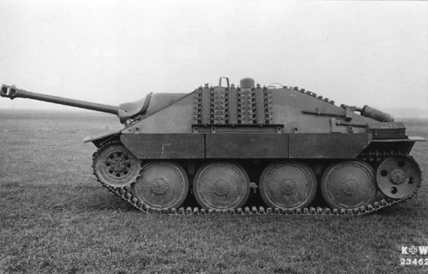 The G-13/Hetzer owned by the TMFM was manufactured at the Skoda facility in Pilsen according to the manuals that came with the vehicle. 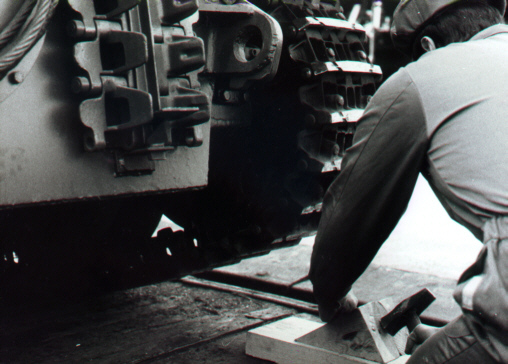 It bears hull number 44 which means it would have been delivered to the Swiss Army in the second lot of 25 on July 28, 1947. Although originally equipped with the Czech gasoline engine, it was converted to the Swiss Saurer diesel engine while in Swiss service. It uses the Czech Praga - Wilson preselect type transmission. The vehicle bears wartime German Waffenamt marks on the main gun, various optics, and some hand tools. It also came equipped with both the German Notek light and the normal Swiss headlight. Here are some additional photos recently obtained from Bob Garlington, which were taken in Grolly, Switzerland during the loading of our Hetzer for shipment to Germany. The photos were taken by the Swiss Army Reserve General that worked for Zurich Insurance. 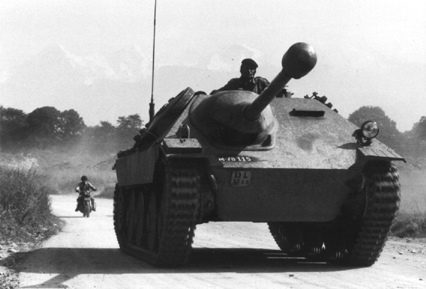 Photos of Jagdpanzer G-13s in Swiss service. These views are of a number of actual Swiss G-13s in use by the Swiss military. This group of seven photos are all from the Swiss Armeefotodienst, sent to me by my friend Lee Archer of England. 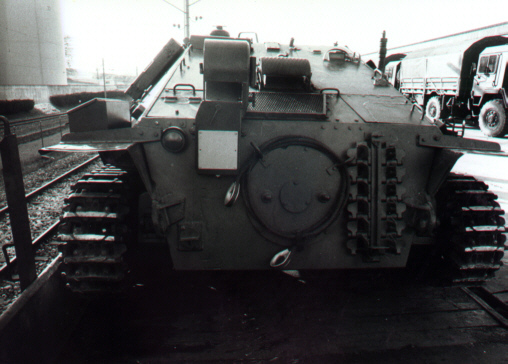 The first photo shows the bracket which normally holds the spare road wheel on the side of the Jagdpanzer. You can just make out the circular spot where the paint has not faded where the wheel had been sitting. Visible in several of the other photos are the holders for the field phone cable located on the rear of the vehicles. 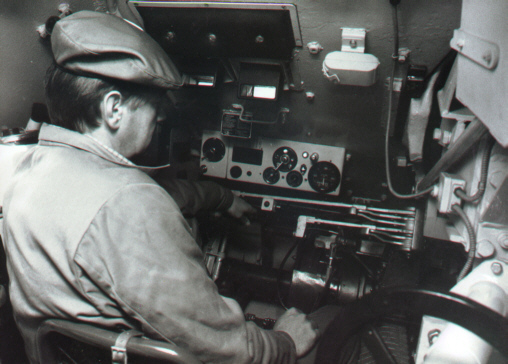 This connection allows a ground observer to direct the Jagdpanzer from some distance away while guiding it into a firing position. The last photo in the group gives a nice side view of a G-13, but that vehicle is missing the field phone device. Thanks for the photos, Lee!